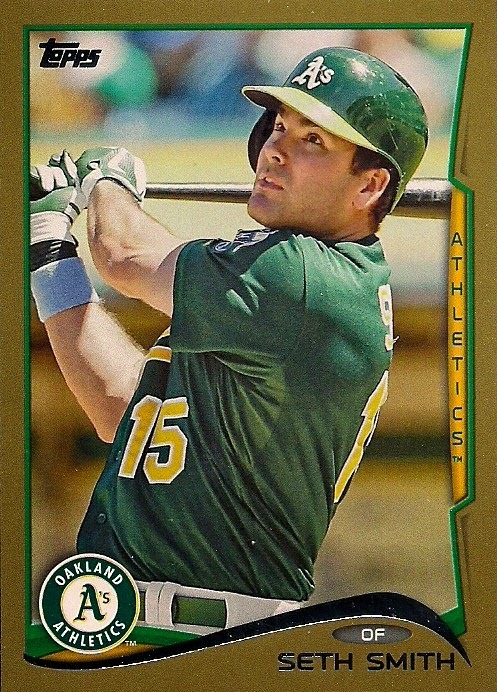 So this was the week that 2014 Topps came out. I suppose if your week was rather mundane then you can define it that way. My week contained a sick dog (still sick, thank you), a minor surgical procedure (irritating the hell out of me right now), a four-day long snowstorm (have you ever seen one foot of snow fall in two hours? I hadn't until Wednesday night), and an ungodly stressful week of work brought on by Super Bowlympics (god, I can't believe I once liked sports). 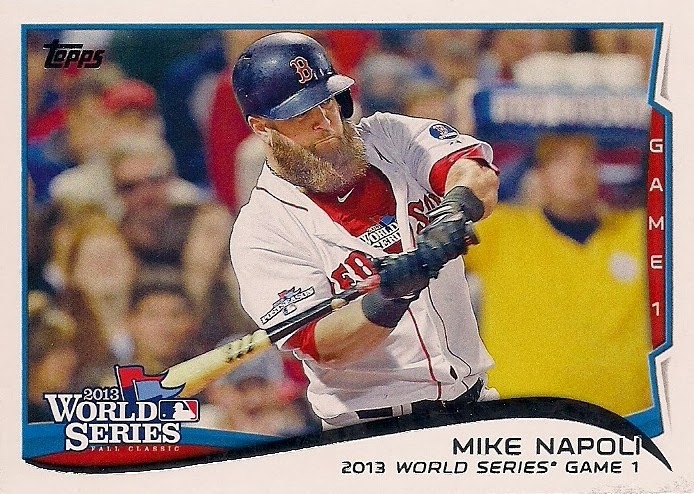 So thoughts of 2014 Topps were on my mind, but physically going to a store wasn't. Today, finally in recovery mode, I ventured out and reached over the very tall man with the shaggy beard pondering a blaster box of football of some sort (don't do it!) 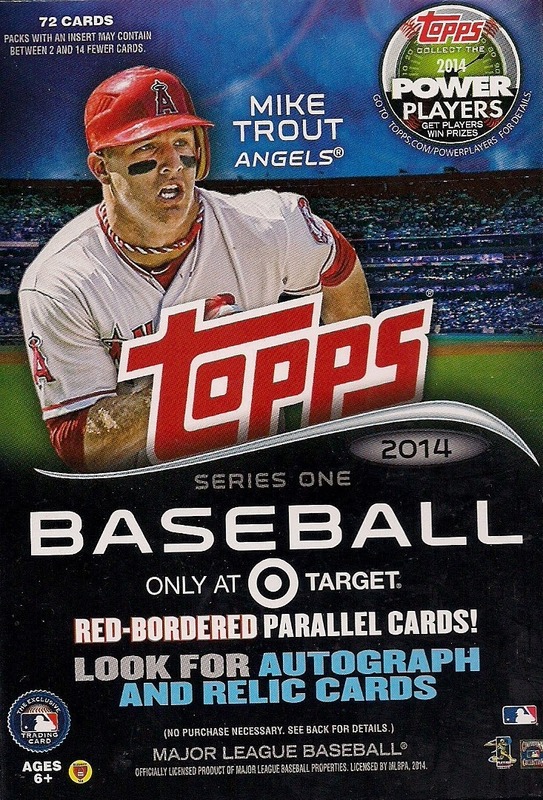 to grab a hanger box of 2014 Topps. It's a little more than I wanted to buy, but it contains a good representation of what's in the set and that's the idea here. 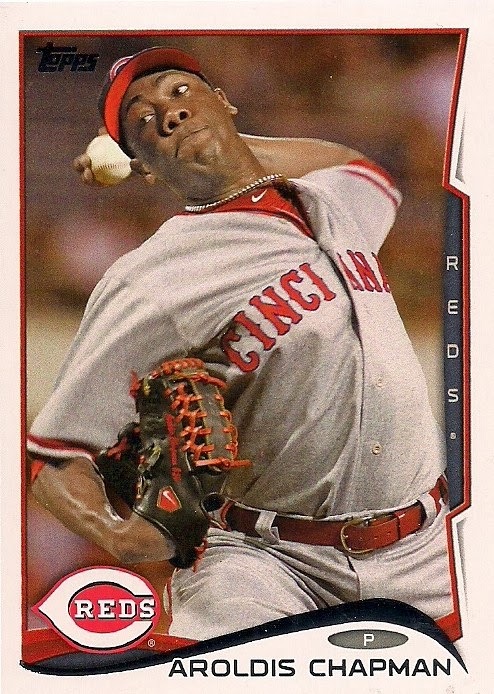 Before I bought them, I had seen all the 2014 card talk all week on Twitter. And the same thing happens every time. Somebody criticizes the cards and then someone criticizes the critics. This bothers me a little. 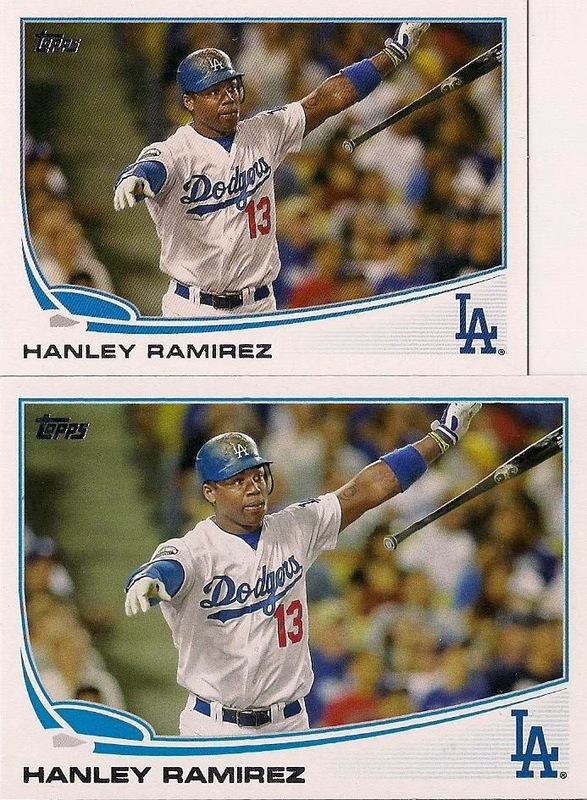 I can see having an issue with people who rip EVERY last move Topps makes. 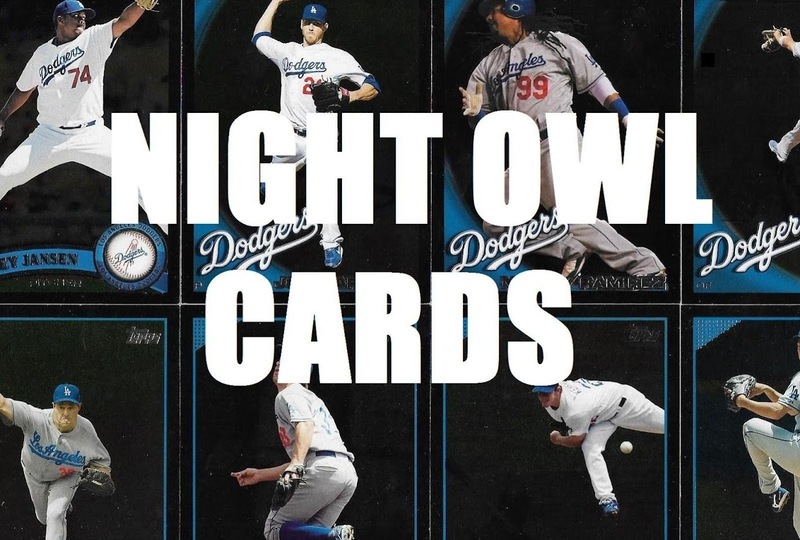 But I think there is room for collectors who buy cards even though those cards may not be their favorites. Because I happen to do that. 1. Buying cards at the start of the year is a tradition. It goes back to childhood. Sometimes tradition is still fun even though the world has changed. Opening packs will still be fun as long as cards are cards. I don't have to love them to buy them. 2. I don't necessarily KNOW that I won't like the cards. 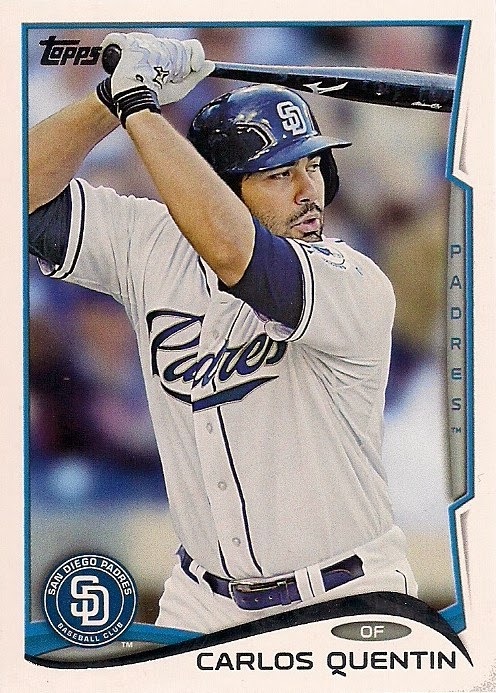 Yeah, I know going in that I don't like some of what Topps does with its base set and I know going in whether I like the design or not. 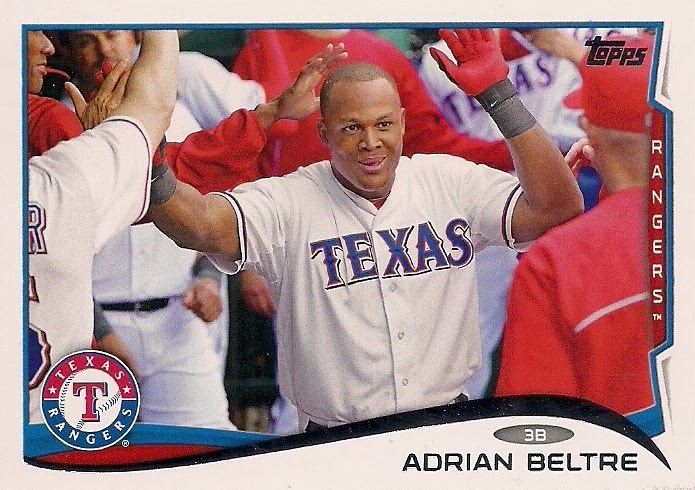 But you never truly know what a card or a set is like until you actually look at them in your hands. And you've got to buy cards to do that. 3. Critiquing cards is expressing love for the hobby. It's the same as any art form. I remember as a teenager waiting for the new record of whatever group. When we finally saw the record in stores and bought it, we would hash over what we loved and hated about the new record/the new sound as only true devotees do. True fans love their hobby and critiquing it is a way of holding on to it, a way to see that nobody hurts it, a way to love it, by expressing what they think is right and what is wrong. This is why I make sure I buy at least one pack of flagship every year. 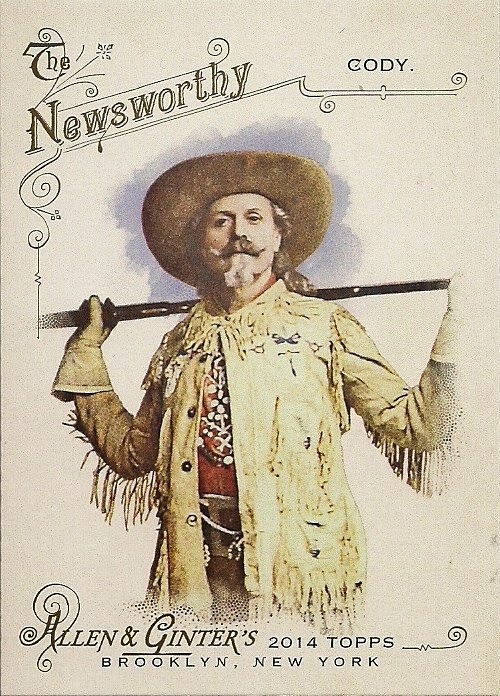 To celebrate the arrival of new cards each year. To celebrate why it is special. To keep the hobby alive, through praise or criticism. Because I love it. 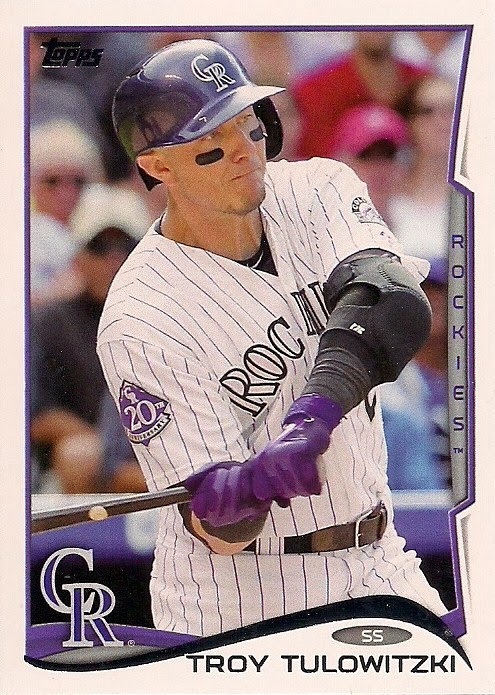 The first card of the year is of the NL MVP. That's much better than previous first cards of the year. 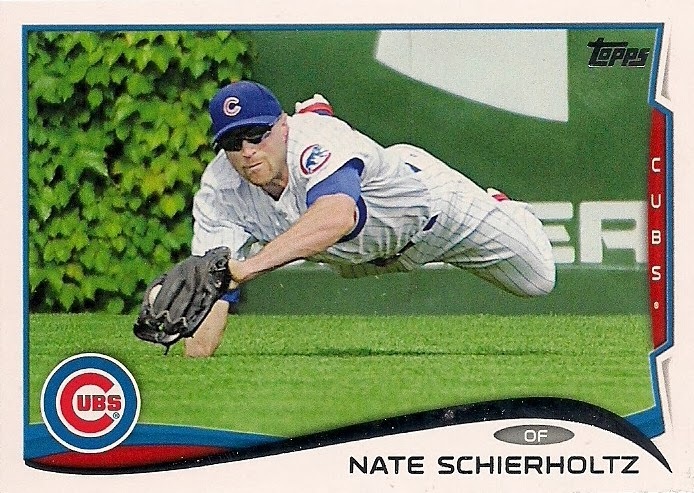 By the way, I read the back of this card and it says "little girls weep when they meet him." Andrew's got to stop taking away their ice cream cones. You were wondering if there are Rockies in this set? So many that I'm going to start counting (1). I was getting bored so I'm showing the back. New to the backs this year is a category for WAR. I made a decision a long time ago, in the early stages of college, that numbers were going to be a small factor in my life. Now I'm paying for it by wondering how someone's career total can be "4.9" when there is nothing higher than a "2.0" in any individual year. We've reached the horizontal portion of the hanger box. Let's pause and look at the design. I've already said that I'm not crazy about it. That team tab on the right has been ripped by more than a few bloggers. I didn't realize the swoosh on the bottom was foil and I actually like it. In fact, in hand, the design looks better than I thought (which is why you buy the cards!). 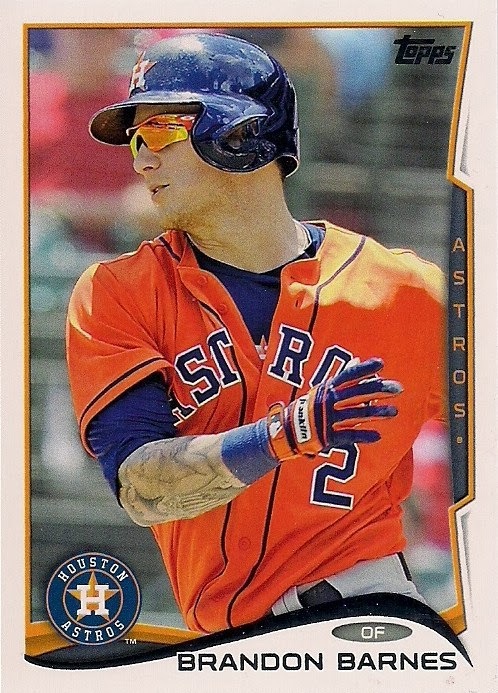 I already like this set better than 2012 Topps. Perhaps most important, this design reminds me of something and I am going to figure out what it is before 2015. I think when I do figure it out, I will like this set a lot more. It strikes at something familiar from the past. Just have to pull it out of my brain. 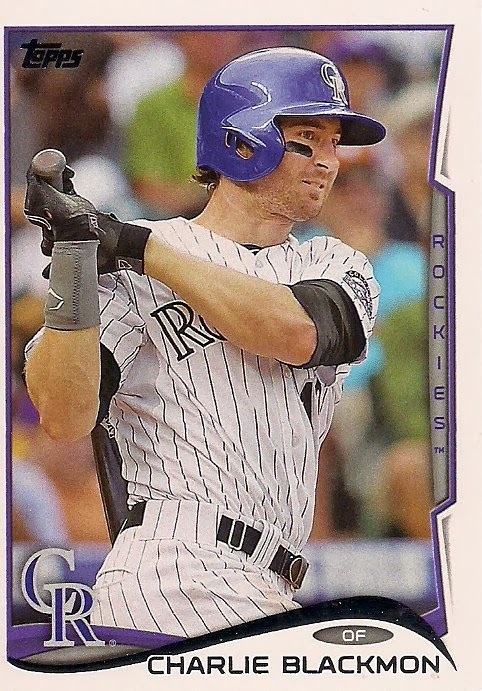 I remember when someone on the blog tried to tell me that purple wasn't a primary color for the Rockies. 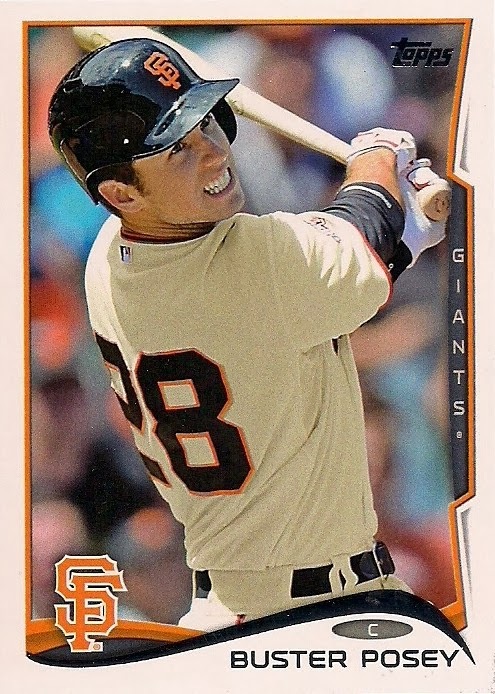 The real reason Posey got home plate collisions abolished? He wants his teeth intact. No bat necessary when you have an awesome arm tattoo I think is what this card is saying? From the special unannounced subset called "Dim Bulbs". 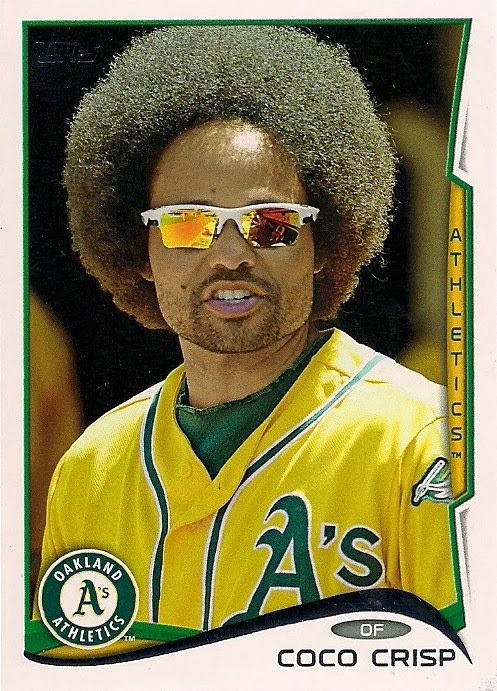 Coco needs to start a movement in which at least 25 percent of MLB players grow afros (yes, even the white guys). Baseball will become more popular than ever before. Ugh, my first Dodger is him. 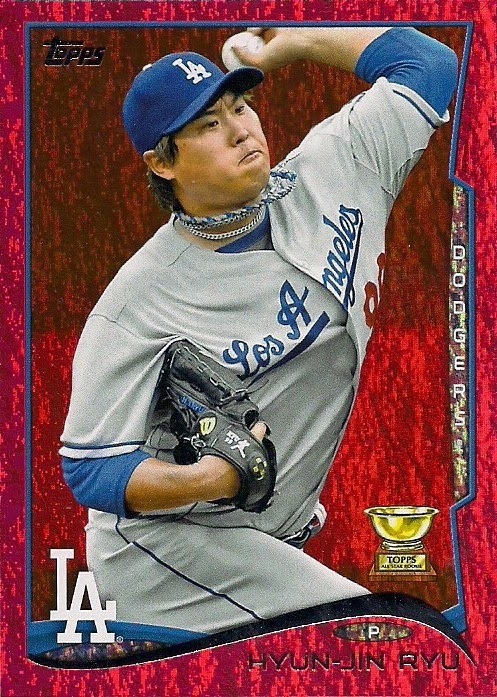 If I want it to be winter forever, all I have to do is think of League on the mound in a Dodger uniform. Iwakuma, you need to puff out your cheeks more. Of course, it's an Athletic. Seth, go sit over there in the corner with the Marlins and the Mariners. You're banished to the box forever. This is the pull of the box. And I want to call these "the walls are covered in blood" parallels. Think that'll work? 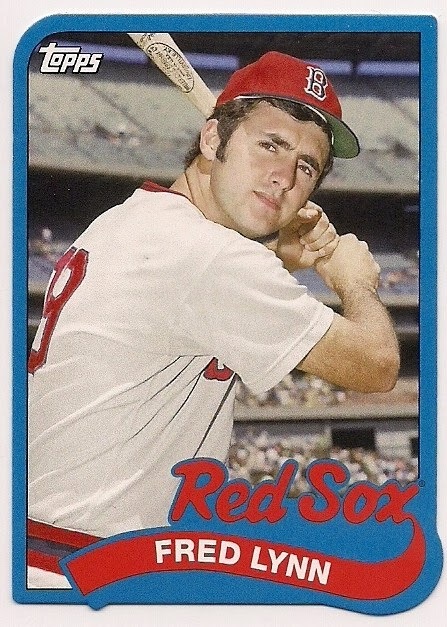 #TM-3 Fred Lynn, Red Sox, '89 parallel. 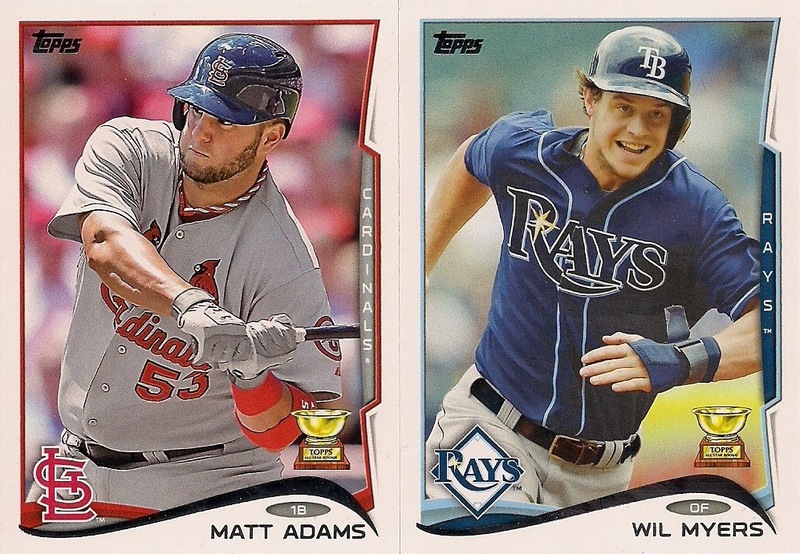 The cards look weird, like some kid cut it out of a larger card (that said, I know I'll have Red Sox fans clamoring for this). 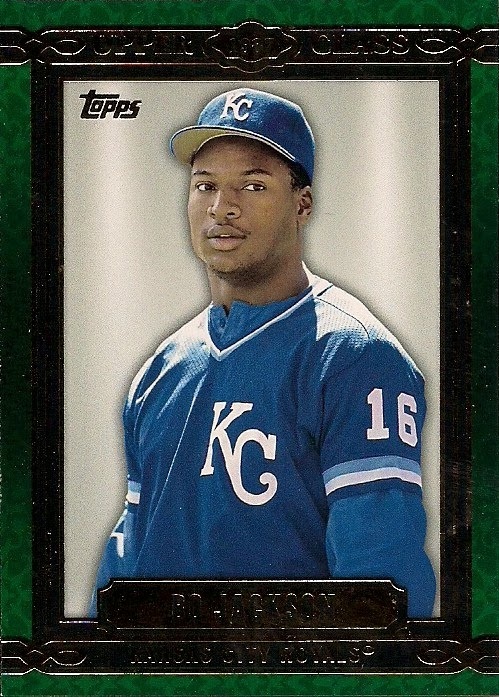 #UC-40 - Bo Jackson, Royals, Upper Class insert set. Classy and boring. Like walking through Lord & Taylor. 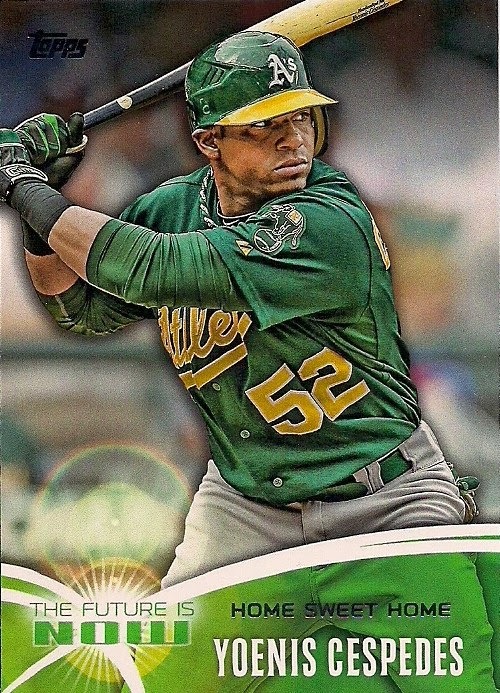 #FN-13 - Yoenis Cespedes, Athletics, Future Is Now insert set. Zzzzzzzzzzzzzzzz. These generic insert sets are coma-inducing. Can we get some inserts back that are about something? Domonic is set aside for someone. The others are floating in the breeze. I think I'm going to like the Walmart blues better this year, which is a rarity. 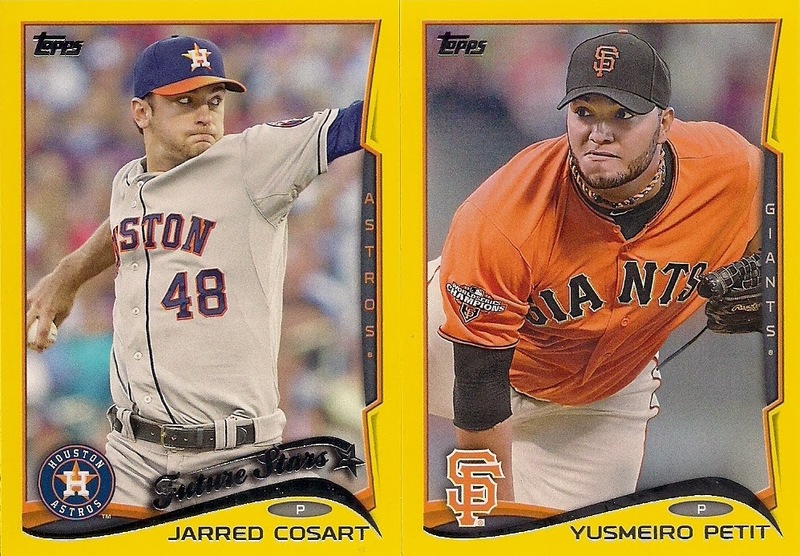 I've read that the yellow parallels are retail-only, which is cool for a collector who is retail-only. And aside from the fact that there are waaaaaaaaaaaaaaay too many parallels, I like these a lot better than I did when I first saw them online. Again, this is why I buy cards I don't think I'll enjoy. Lots of White Sox, too. And lots and lots of throwbacks. Not sure why he gets a Future Stars logo, since most Future Stars are guys I've heard of only slightly. 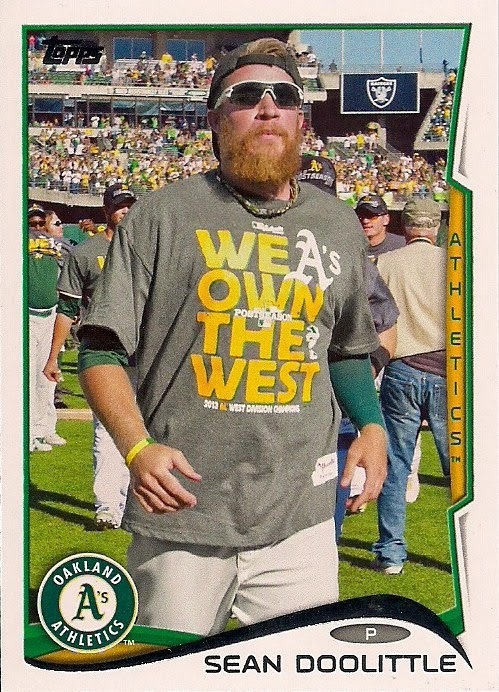 And with that awesome card, the A's take over the Rockies with the seventh card in the pack. A's and Rockies. Yeah, this is going to be a hell of a trading season. That's the whole hanger box. So what have I learned here? 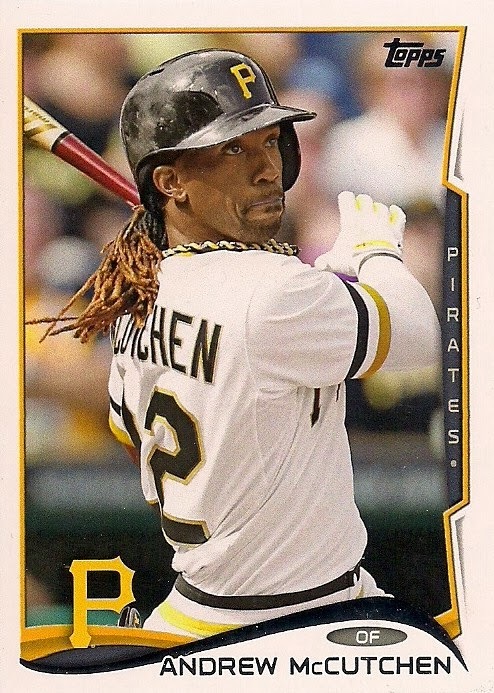 Well, I like the yellow parallels better than I thought I would. I like the design a little bit better than I thought I would (still not thrilled with it). I think the '89 minis are an abomination. There's always something to discover in a new pack of cards. 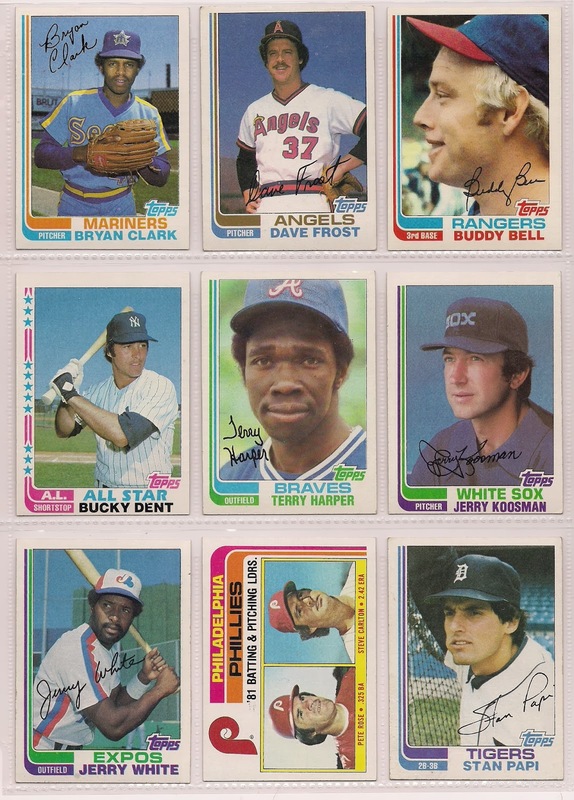 One of my regrets from last weekend's card show is holding 1970s Kellogg's cards in my hands and not buying any of them. Normally, when going to a card show I note that if I find '70s Kellogg's cards, I will make certain that they are captured, tagged, bagged and strapped to the top of the car for the long trip home. But I had them in my hands and then I let them get away. I can only hope that they will be fruitful and multiply. I had an excuse of course. When I'm surrounded by deeply discounted 1950s cards even Kellogg's can't compete with that. 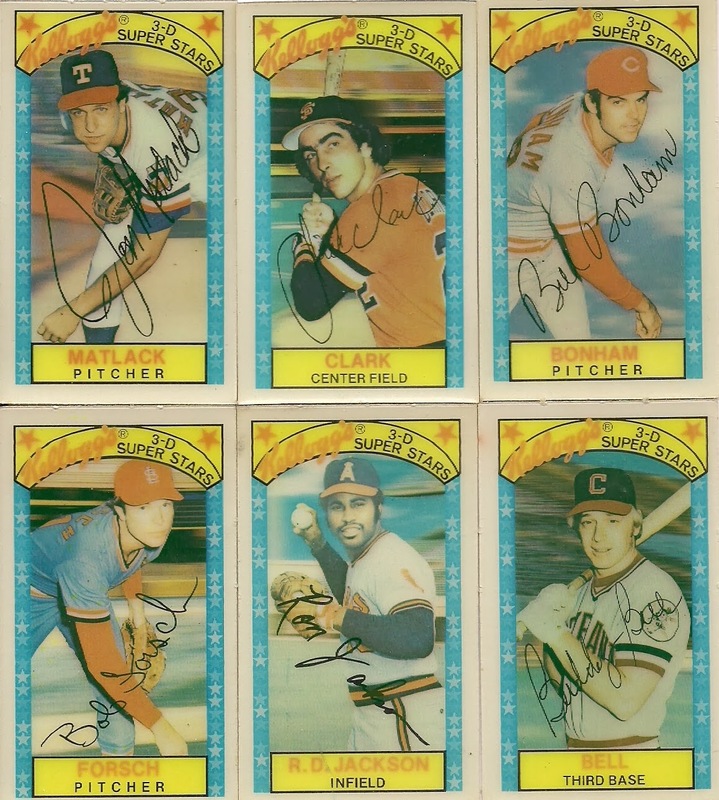 The other excuse was I had just received a bunch of '70s oddballs from Scott Crawford On Cards! Exclamation points!!! The reason I love '70s oddballs so, and prefer them vastly to any other kind of oddball, is because they are part of the pipeline. I've written about the pipeline before, many times. 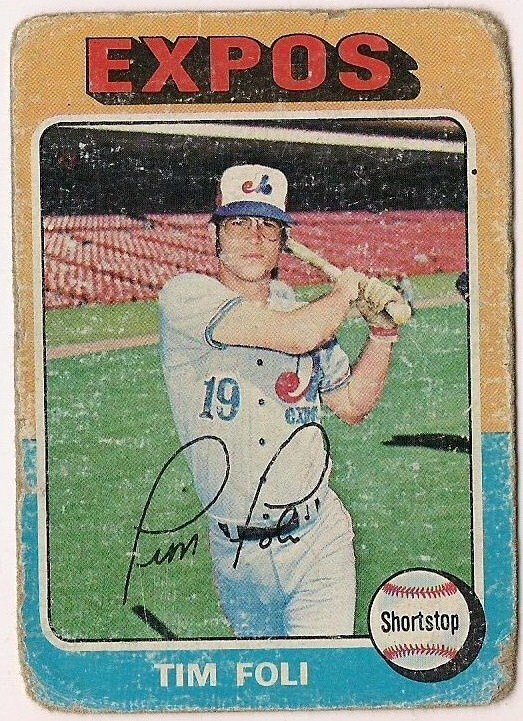 The pipeline is cards from the '70s. 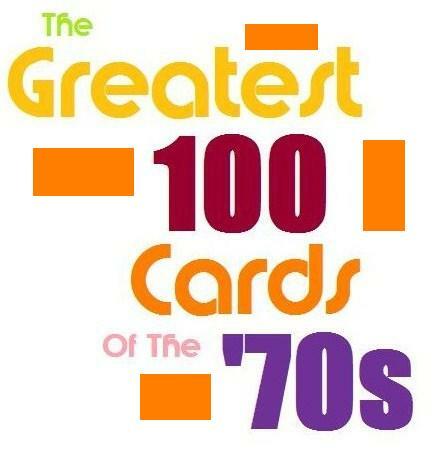 Specifically cards from 1974-80, but I'll allow 1972, 1973 and 1981 in there as well. These cards are the pipeline to my childhood. Maybe you have to reach my age or maybe I'm just super nostalgic, but my collecting life would be a hollow shell if I couldn't access the pipeline. 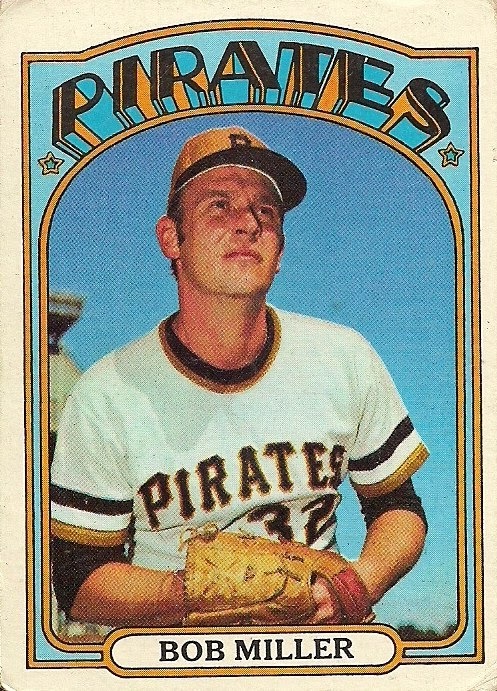 In fact, sometimes I wonder, what will I do when I've accumulated all the cards from the '70s? All the 1975 minis. All the TCMA cards. What. Will. I. Do? I know what some people will answer -- there's always something else to collect -- but will it provide the thrill of the pipeline? Fortunately, I don't have to face that kind of horror right now, and won't for years. Instead I get to take a ride in the pipeline right now! 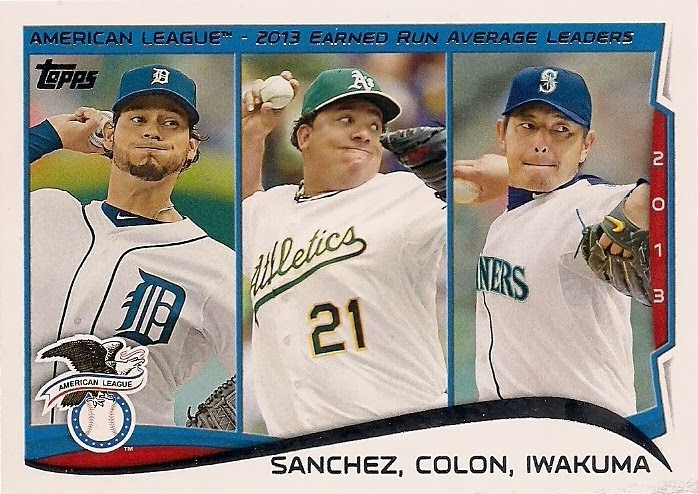 Courtesy of Scott (who, by the way, has the most spot-on review of 2014 Topps that I've read so far). "Even if we win, even if we play so far above our heads that our noses bleed for a week to 10 days, even if God in heaven comes down and points his hand to our side of the field, even if every man, woman and child held hands together and prayed for us to win, it just wouldn't matter because all the really good looking girls would still go out with the guys from Mohawk because they've got all the money! It just doesn't matter if we win or we lose. It just doesn't matter!" In 1979, my brothers and I had progressed beyond the point of fighting each other for the one Kellogg's card that was in the one box of Frosted Flakes that we would get that summer (I swear Kellogg's put its cards in cereal boxes for exactly 6 weeks and cackled the whole time as they watched us from a giant camera in their tower in Battle Creek, Michigan). We realized fighting for one card was uncivilized behavior and, hell, we were working men now with menial chores around the house that paid us approximately 50 cents a year. Why not put that cash to use? 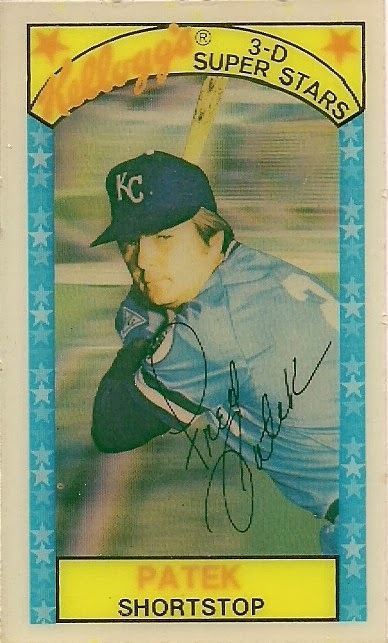 So we'd pool our money and cut out the order form on the side of the box and buy an entire set of 1979 Kellogg's cards. Then we'd wait until ... oh, 1983, and one day those cards would arrive in the mail. We would take them out of the package -- I'm sure there was a fight over who got to pull them out of there -- and then we'd spread them out on the red shag rug in our basement (don't ask) in neat little rows. Then we'd take turns picking cards until the were all divided up. Each of us would come away with about 20 cards and we'd have those memorized in about 24 hours. 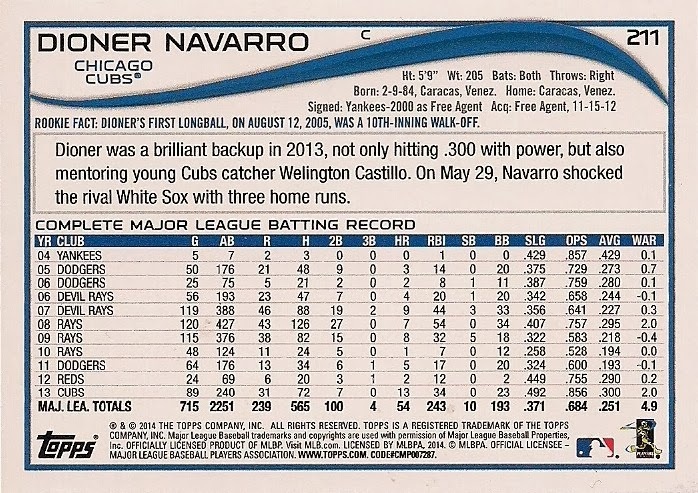 One thing I noticed when we were dividing up the cards was that each of the cards said "3-D Super Stars" on the front. Super Stars. The best of the best. The guys we read about in the sports section every day. 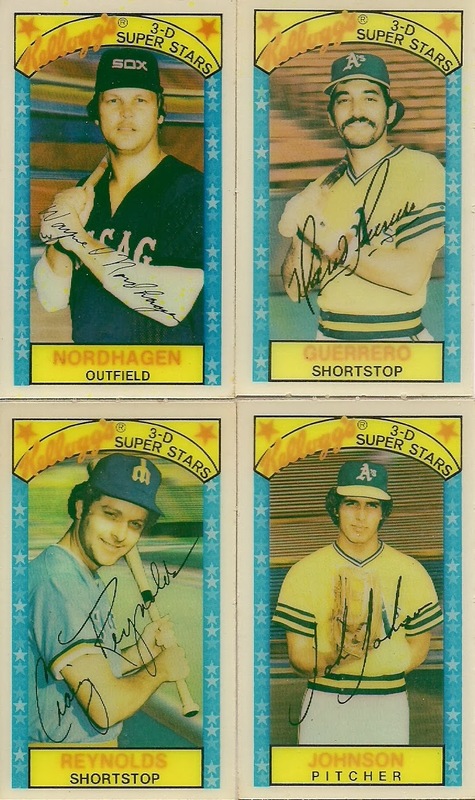 Granted, all these guys played baseball better than I could -- even when I was 13 -- but I knew what was up in '79. The Oakland A's SUCKED. The Mariners were an expansion team and they definitely SUCKED. 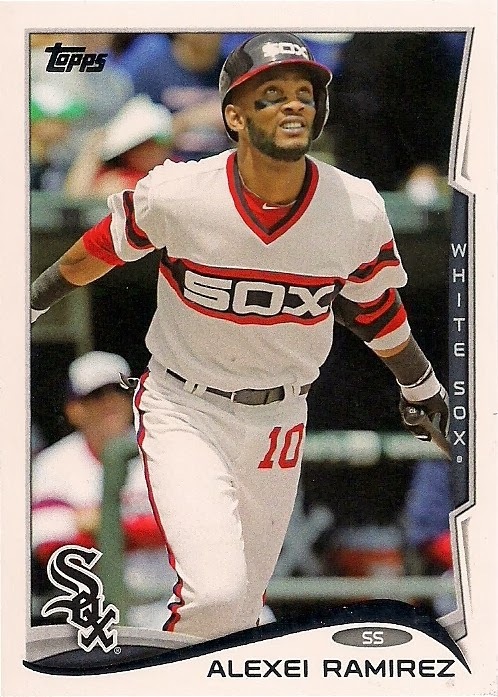 The White Sox had weird uniforms and guess what? They SUCKED. Collective record for the three in '79: 194-290. 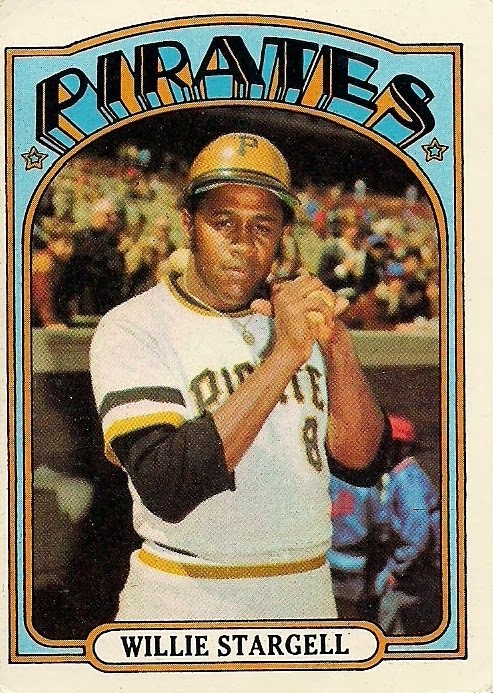 You couldn't tell me -- even when I was 13 -- that these were among the best 60 Super Stars in baseball. I didn't have the brainpower then to search for who was left out of the set. I have the brainpower now, but not the time. Trust me. People got left out. Lawsuits were filed. But that's a small thing to me these days. I just want to see that 3-D action. 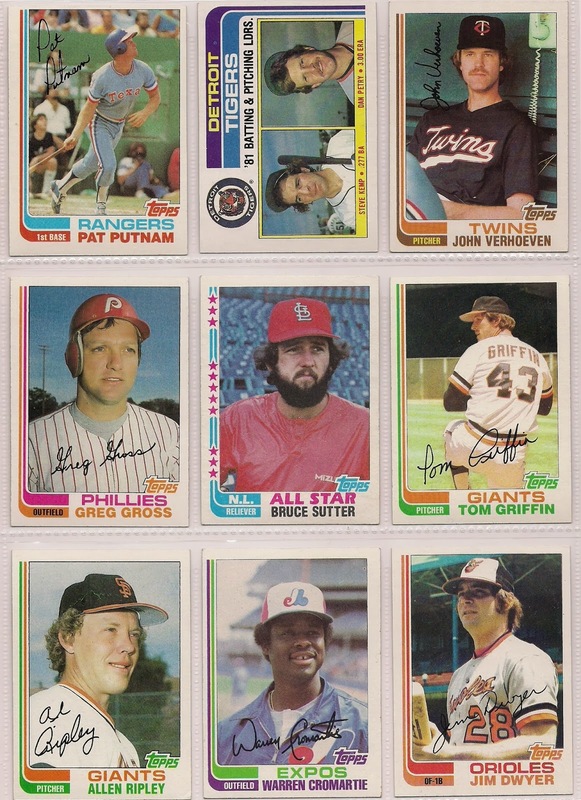 I still have those select '79s, which is why I agreed to receive some more from Scott. Completing this Kellogg's set and several others will keep that pipeline going for years. These are Hostess cards from 1977, which happens to be the very first year that I obtained a Hostess card. Outside of Dodgers, I never had another one until now. Your eyes don't know where to look do they? McBride's Spirit of '76 cap? Alexander's mustache? LeFlore's prison record? The '70s were great, I'm telling you. May they live forever. 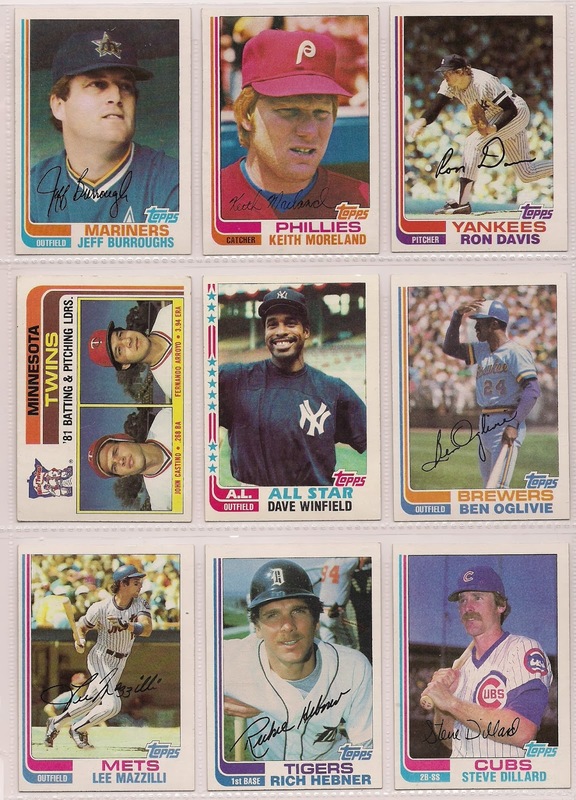 Scott also sent me one card from the 1978 Hostess set. You'll need to take a deep breath for this one. You could play an existential game of "What's real and what's not" with this card. Real: Gamble's chain. Not real: that fool cap on his head. Real: Gamble's crestfallen look. 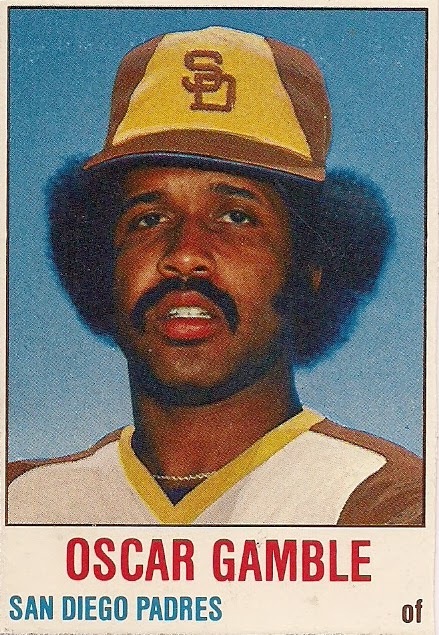 Not real: The Padres uniform colors. Because they are not to be believed! I am so privileged that I got to collect cards at this time. That's three 1970s characters right there. This is the final year of Hostess, in its '70s format anyway. I didn't even know Hostess existed in 1979 for a number of years. I was too preoccupied with Kellogg's that year. That and aliens bursting out of people's chests. Oddballs were never the same after the '70s. I can appreciate some '80s oddballs, but others I kind of shrug off. Most 1990s oddballs are too fancy for me to consider them oddballs. 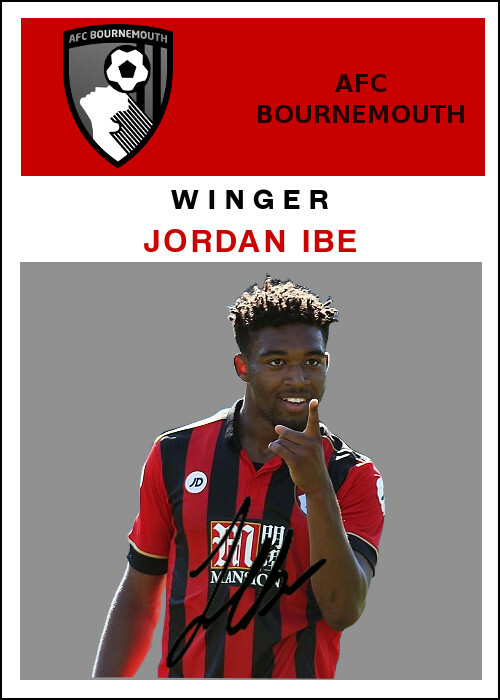 I like the Panini Hometown Heroes set a lot. It's about as good as oddballs can get now. These also came from Scott. 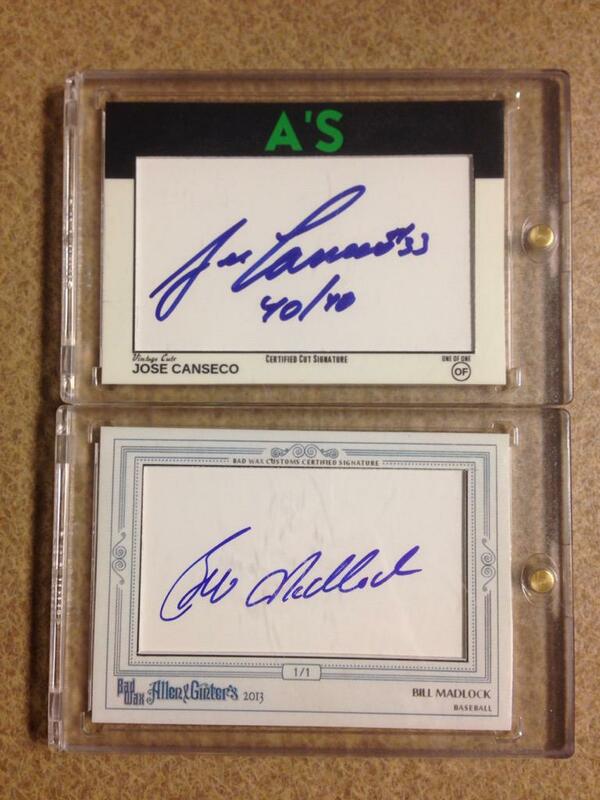 (Please note that Lasorda is not too pleased that his number 2 is blue). 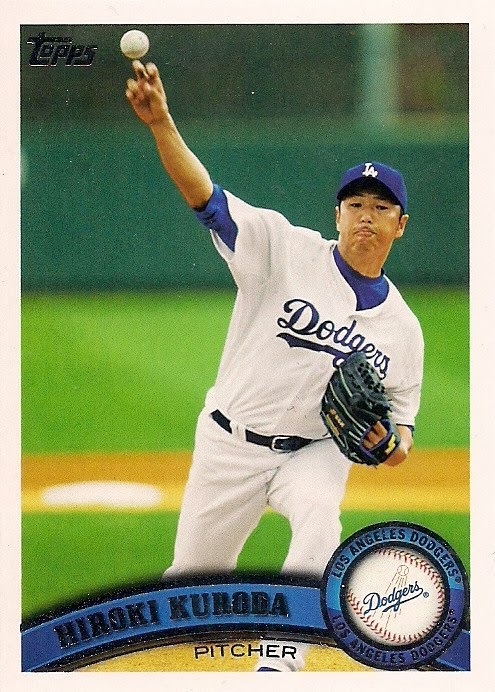 Several Dodgers team set cards from 2011, but I'm showing just this one because it's the only one different from the main set. 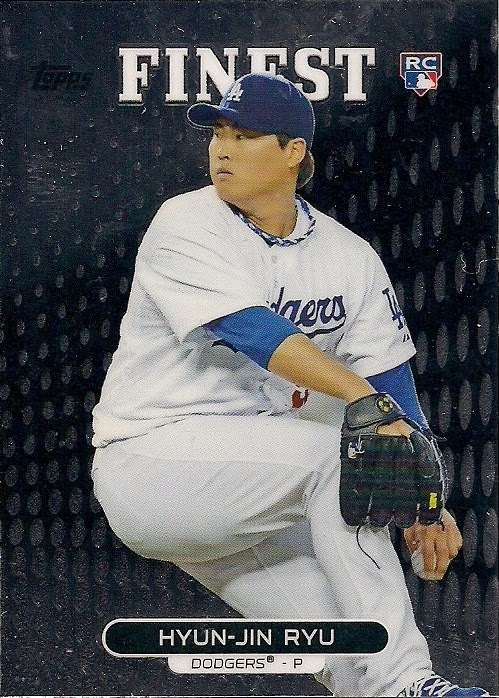 A shiny 2013 Finest of Hyun-Jin Ryu. 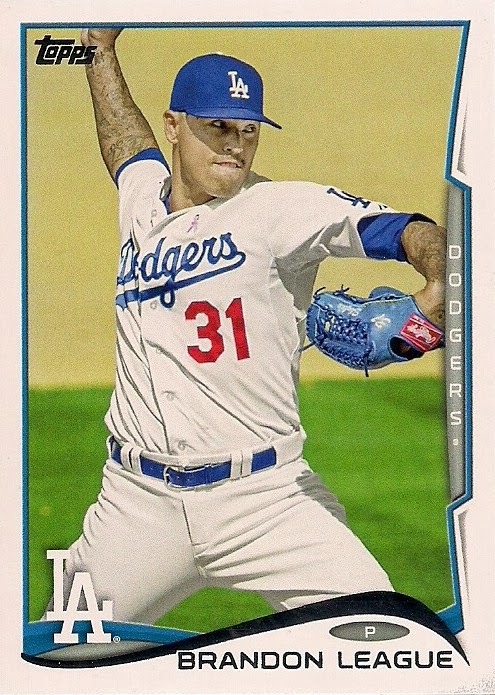 And a mini version of the best Dodger card from 2013 Topps. None are as exciting as the Kellogg's and Hostess cards. Because none can take me through the pipeline. It's the best amusement park ride in this hobby. 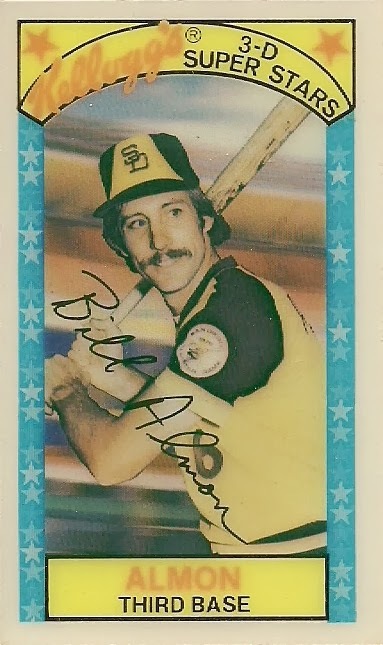 A few months ago I wrote a post about the best collection of Topps sets when you grouped them by year. For instance, all the sets from a year that ends in "7." My favorites out of that particular grouping are probably the "3s" and "5s". But no matter what my favorites are, it's a fact that there is only one group number for which I have not completed one set. That group is the "2s". 1. 1952 - iconic set that's way too expensive to complete, not that I've tried. 3. 1972 - currently attempting to complete, it's a toughie. 4. 1982 - currently attempting to complete after ignoring it for too long. 5. 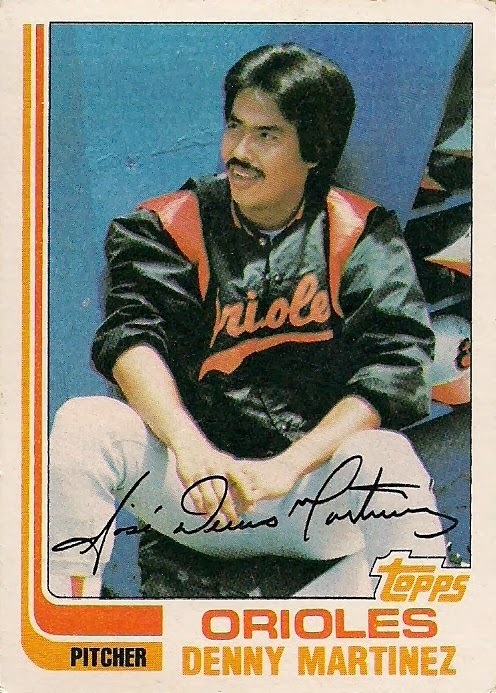 1992 - it's OK, but early '90s cards take me to a bad place. 6. 2002 - pretty ugly set, not much interest. OK, then. 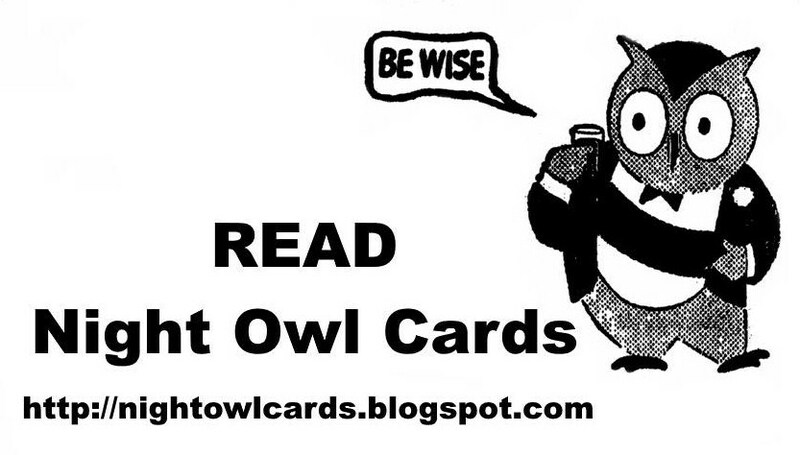 The "2s" are not very popular with night owl. But I'm doing something about it. The two sets that I am chasing most vigorously right now each happen to end in "2s" -- 1972 and 1982. And I'm getting some help. 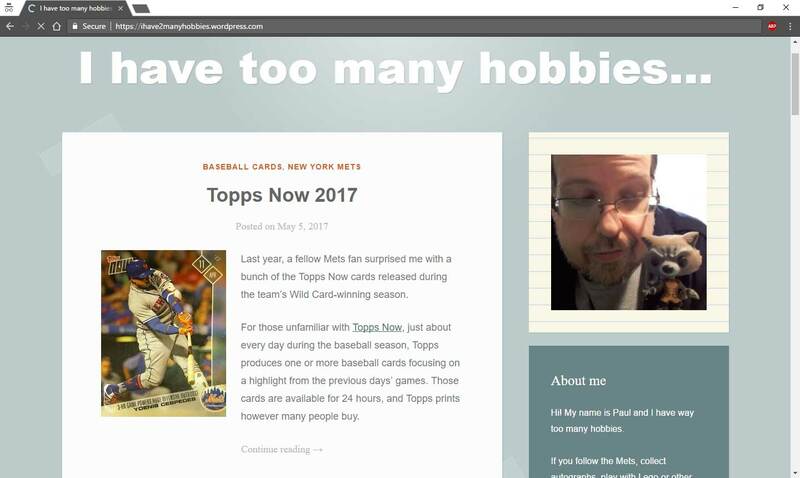 Recently, Mark H. discovered that there are people who blog about baseball cards. And to celebrate this discovery, he's been sending bloggers cards! This is very proper behavior, by the way. Not too long ago he sent me cards from both 1972 and 1982 to help me with my sets. He also sent one other card and one other non-card item that I'm saving for later. Trust me, they will be well-timed. But let's see the twos, shall we? Starting with 1982, of course. Mark sent a whole bunch so I had to display them nine at a time. They were all minty fresh, too and I got a faint whiff of gum from them, which is great. Not as great as Doug DeCinces signing an autograph, but still great. The Bruce Sutter card is literally the star of this panel. The Verhoeven card I know I had once before. I don't know why I got rid of it. I'm guessing someone collected phone cards. 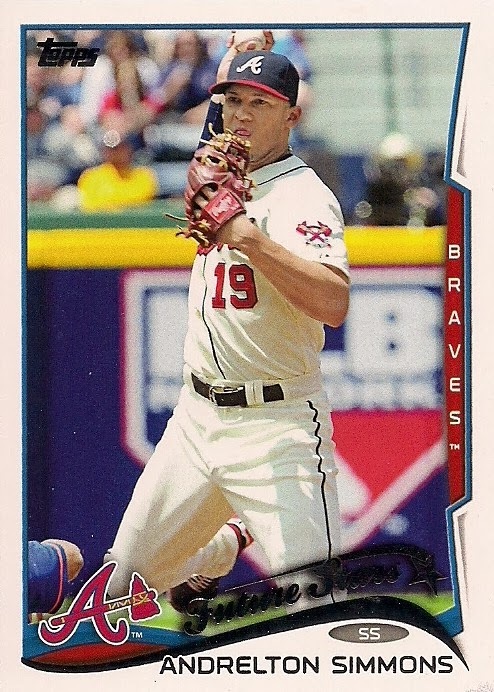 The Buddy Bell card is finally mine. 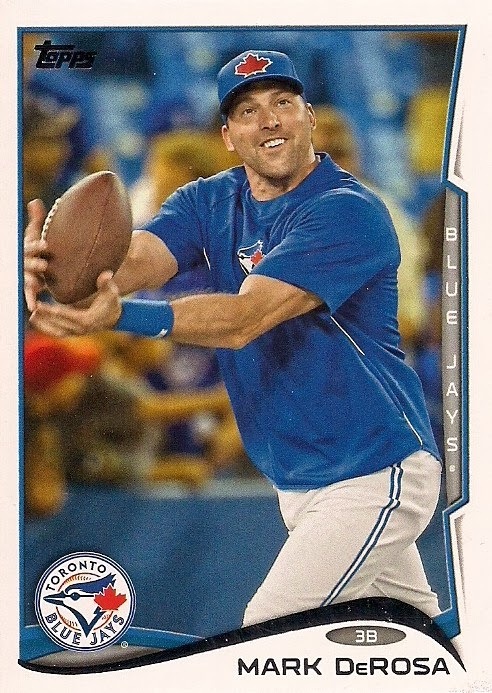 The mournful Terry Harper card is finally mine. I'm so happy! 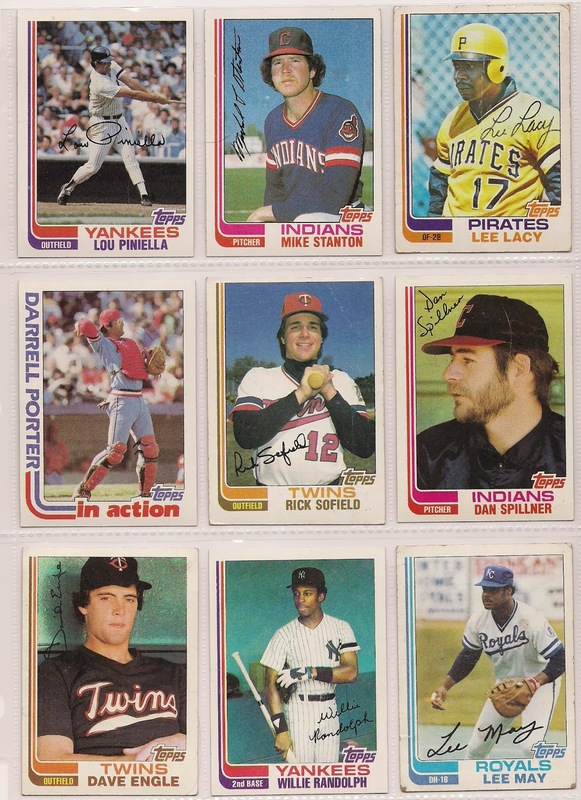 I distinctly remember collecting '82 Topps back in '82 and noting how few Yankees came out of packs. 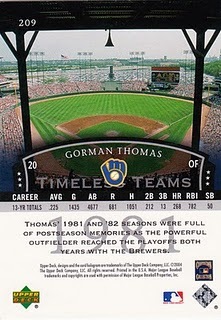 Particularly the all-star cards, of which the Yankees had four. 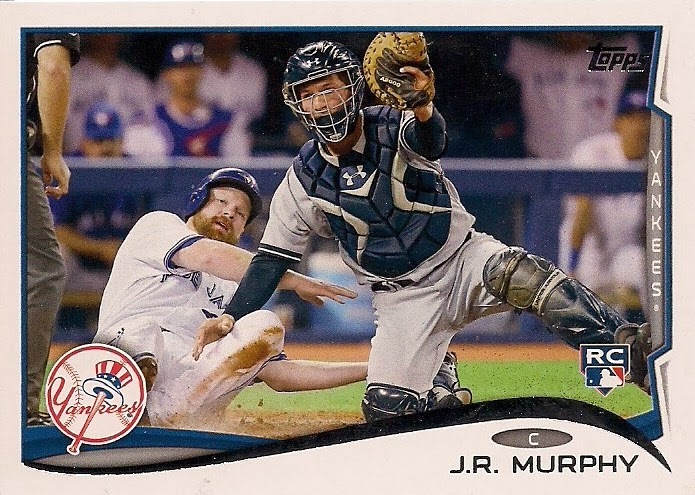 By this point, my Yankee friends had stopped pestering me for cards, so I figured it was a Topps plot to filter Yankees cards away from Yankee haters. I think that's the last "in action" card I need. Or maybe not. But I'm absolutely certain that it's a great card. 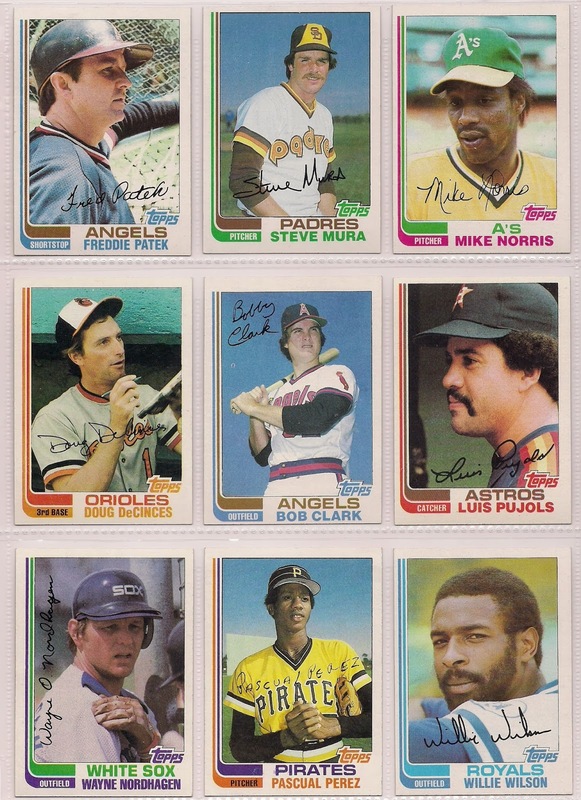 1982 Topps still evokes memories of the excitement I had as a youngster collecting cards, even if I was well into my high school years. 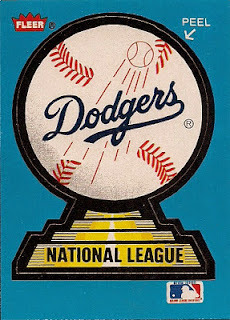 Now moving on to some cards that I didn't collect at all when they came out -- because I didn't know what baseball was at the time. 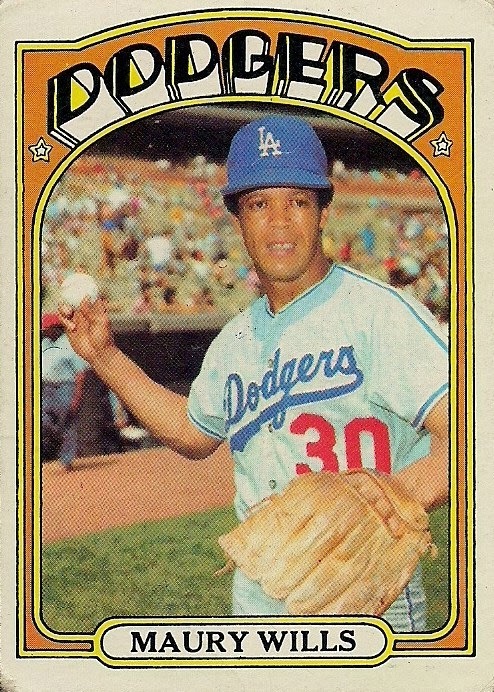 This is the best set of the "2s" and what better card to illustrate that than Maury Wills' last card? 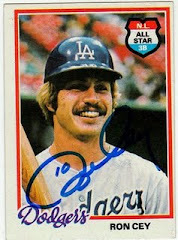 A former Dodger. 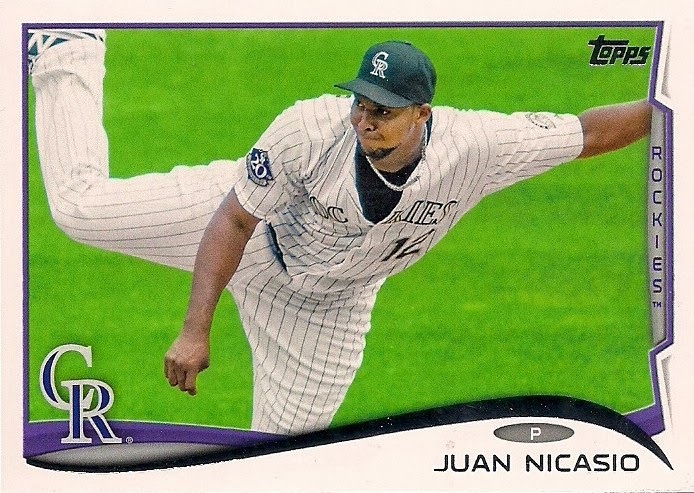 And a former Cardinal, Met, Twin, Indian, White Sox, Cub, Padre, Pirate and Tiger. Not everyone can be a one-team man. 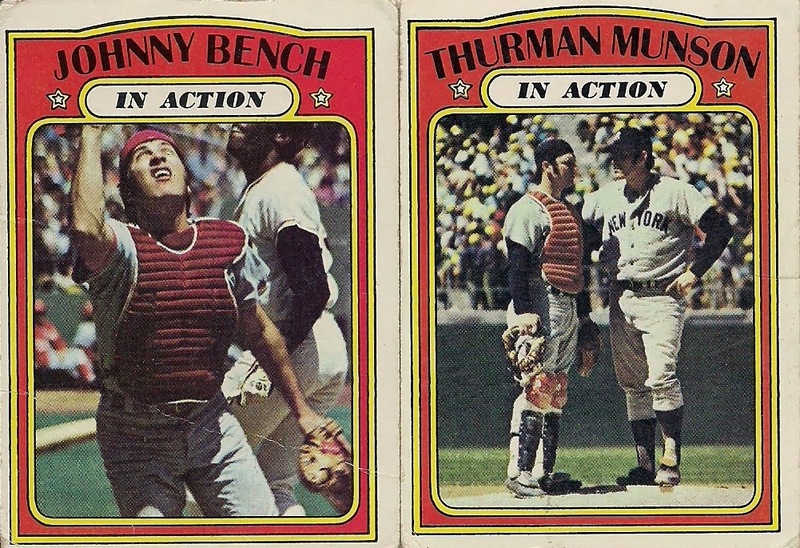 Finally, two of the best catchers of the 1970s in action. That's another reason why I should treat the "2s" sets with a little more respect. They were the only sets to dedicate an entire subset to "IN ACTION." 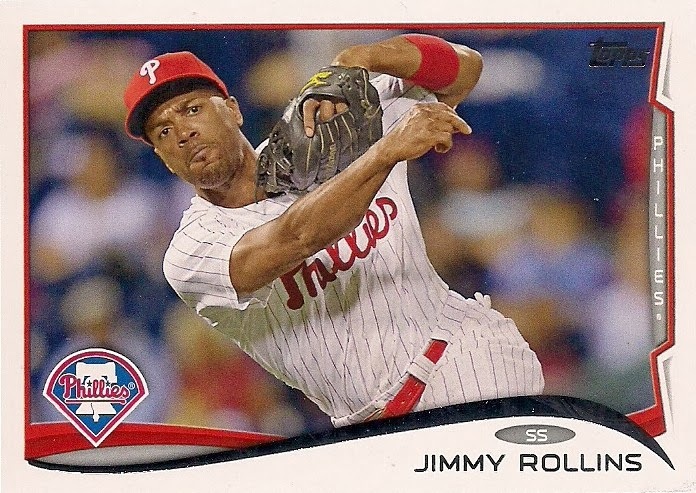 But that's probably not enough for me to ever try to complete 2012 Topps. Not playing your games no more? Is this dumb or am I just confused?